Regular solar observers have noticed that since mid-2016, the Sun has occasionally been devoid of sunspots. These spotless disks will gradually become a familiar feature as the solar cycle is heading for its next minimum, currently expected by the end of this decade. The number of spotless days can vary significantly from one solar cycle transit to another. For example, during the previous minimum (around 2008), no less than 817 spotless days were recorded, whereas the minimum period leading into solar cycle 23 (around 1996) counted only 309 such blemishless days. As the current solar cycle 24 will gradually give way to the new solar cycle 25, several consecutive days and even weeks without sunspots will become the norm. 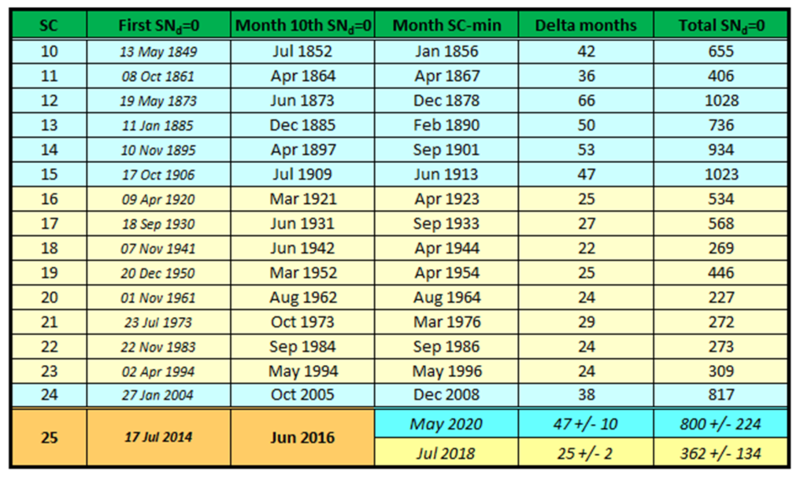 In order to have an idea on the number of spotless days, and how these numbers compare to past solar cycles, the SILSO folks have created a “Spotless Days page”. This page contains graphs and tables on the accumulated number of spotless days, stretches of spotless days, and comparisons to other solar cycles – all supplemented with a word of explanation. The previous minimum surprised scientists and solar observers by being the deepest in nearly 90 years. Will the upcoming solar cycle minimum show as many spotless days, or will solar cycle 25 take off much faster than expected? This “Spotless Days page” will provide you with a front-row seat on the current status of the solar cycle minimum and the number of spotless days. Enjoy! 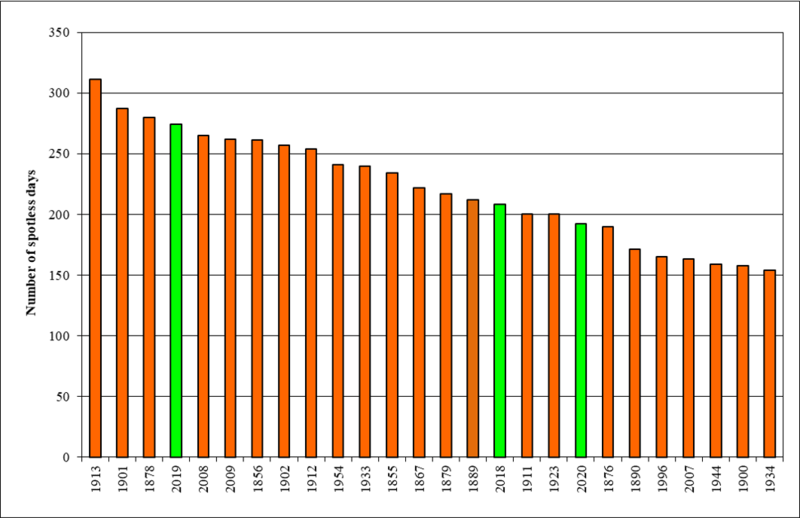 The thick green line in the graph above shows the accumulated (total number of) spotless days so far during the transit from solar cycle 24 to 25. The thick blue and red line show the same parameter, but respectively for the average of solar cycles 10 to 15 and 24 (SCo), and of solar cycles 16 to 23 (SCn). This distinction is made because the first group has a long delay (about 4 years) and many spotless days (almost 800 on the average), whereas the other group has barely 2 years between the month with the 10th spotless day and the cycle minimum, and not even half of the total number of spotless day of the first group (less than 400 days!). It must be noted that the extremes between the cycles in a group can be even more significant: For example, in the SCo-group, the final number of spotless days has varied between 406 and 1028! The thin dashed lines show the respective standard deviations (+sd and -sd). To avoid overloading the graph, purple and pink vertical lines representing the average timing of the cycle minimum (and standard deviations) compared to the month with the 10th spotless day, and this for the respective cycle groups (SCo min, SCn min), are not shown. The values are respectively 47 +/- 10 and 25 +/- 2 months. Currently (March 2019), the spotless days evolution (bold green line) seems to gradually deviate from the average of the SCn cycles (red curve), remaining nearly parallel to that of the SCo cycles (blue curve). The current rise in spotless days is fast, and nearly coincides with that of the previous solar cycle transit. Note that a fast rise is no guarantee on a very high total number of spotless days, as can be seen in this chart: SC25_fast risers.png. This indicates that the final number of spotless days for the ongoing transit may still end up somewhere between 450 and 1050. As the fast rise of the number of spotless days continues, the chances on an early solar cycle minimum diminish. . 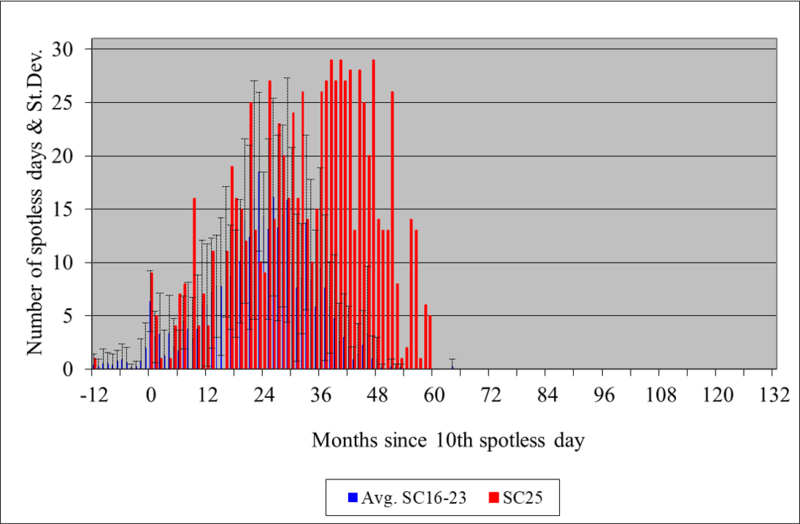 The two graphs above show the monthly number of spotless days during this cycle transit (red) compared to respectively the average number during SC10 to 15 and 24 (SCo; top), and during SC16 to 23 (SCn; bottom). The baseline is again the month with the 10th spotless day after solar cycle maximum. Any spotless days happening more than 12 months before this baseline (month "0") have been accumulated in month "-12". The "T"'s represent the standard deviations. 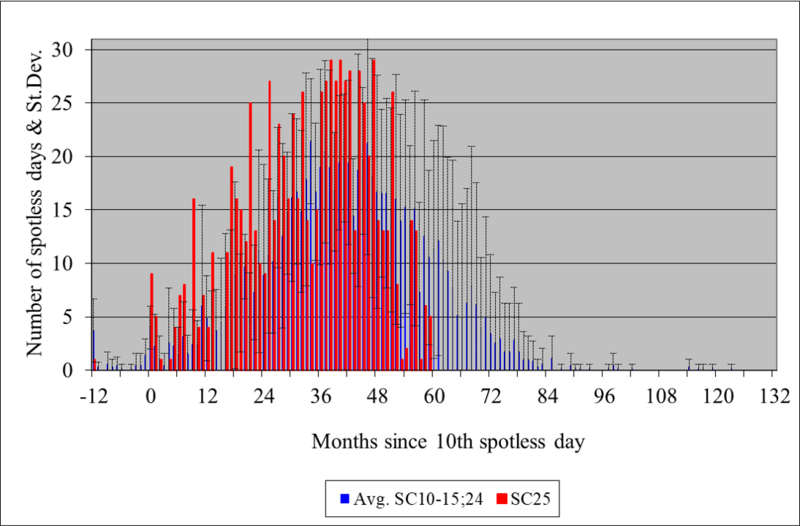 There's a big difference between the two groups, with the SCn-group peaking early around 2 years with an average of about 10-15 spotless days per month, whereas the SCo-group peaks only after 4 years with an average of 15-20 spotless days per month. The table above gives for each new solar cycle the date of the first spotless day (after solar maximum...), the month with the 10th spotless day, the month in which the (Meeus smoothed) solar cycle minimum took place, the delay in months between those last 2 timings, and the total number of spotless days that occurred during the cycle transition. As can be seen, there is a big difference between the two solar cycle groups. 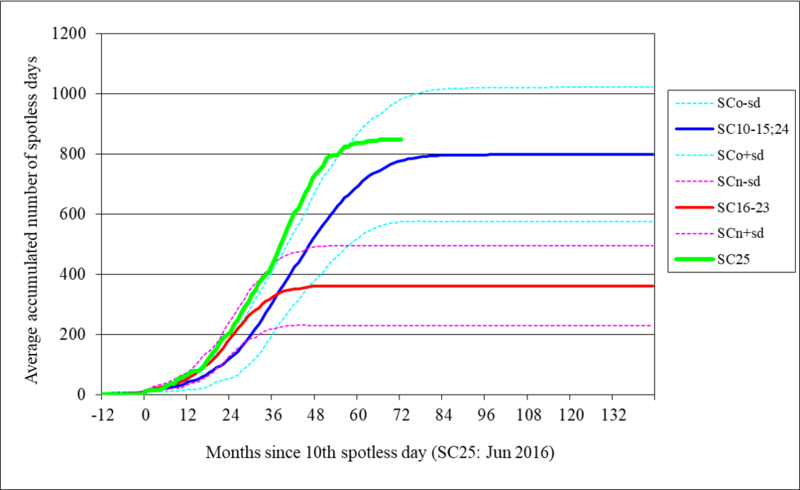 The first group (SCo; light blue) has a rather long delay (47 months) and many spotless days (about 800 on the average), whereas the other group (SCn; yellowish) has only 25 months between the month with the 10th spotless day and cycle minimum. Notice also the very narrow band in timings (only 4 months!) for the SCn-group. The SCn-group contains on the average not even half of the total number of spotless day of the SCo-group (less than 400 days vs. 800!). Note there's no obvious correlation between the total number of spotless days and the subsequent solar cycle maximum (r2=0.35). For example, a total of 200 to 400 spotless days can result in a cycle maximum sunspot number between 150 and 250. Not very accurate indeed! In view of the ongoing revision of the sunspot number, it is possible there may be some changes in the number of spotless days for SC10-11. The table above shows all periods with 30 or more consecutive spotless days. The period from 31 July 2009 till 31 August 2009 (SC23-24 transit) is one of the longer ones since the beginning of daily solar observations in 1849. It is interesting to note that the longest spotless stretch during the SC23-SC24 transit was also the last to make it into the table above. An even longer period in recent history occurred during the SC22-SC23 transition, from 13 September 1996 till 24 October 1996, when the Sun was spotless for 42 consecutive days. One of the longest spotless periods (since 1818) is probably from 24 October 1822 till 12 March 1823 (140 days! ), but unfortunately, the series are broken on 29 December 1822 (no observation available for that day). The longest spotless stretches so far this solar cycle transit occurred on 22 October – 07 November 2018 and on 16-31 December 2018, totaling respectively 17 and 16 spotless days. 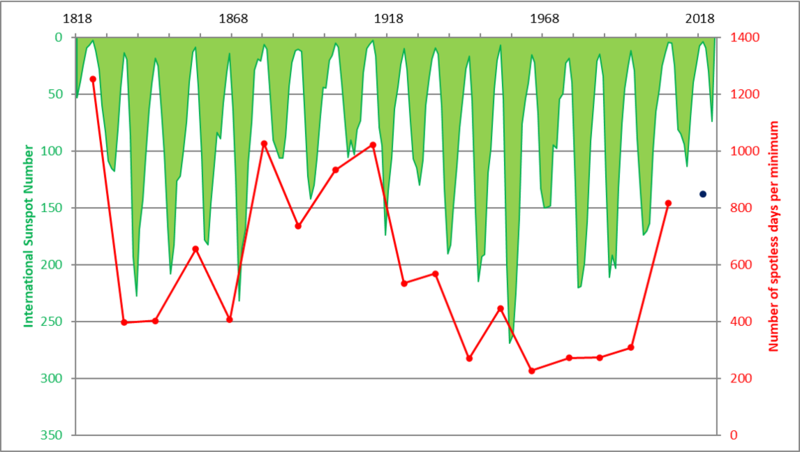 The graph above shows the evolution of the total number of spotless days per cycle minimum transition and the yearly international sunspot number (Sn) since 1818. Note the values for Sn are in reverse order. The number of spotless days has been set in the year of the cycle minimum. For example, there were 817 spotless days during the SC23-24 transition, and this data point has been set in 2008, the year of the solar cycle minimum. There are some missing data for the period 1818-1849, and the data for SC10-11 are under revision, but all in all this graph conveys pretty well that -in general- a low amplitude cycle is preceded by a solar cycle transition with a high number of spotless days, and vice versa. Nonetheless, there are some notable exceptions, such as SC16 and SC20. The blue dot to the lower right represents the number of spotless days (388) for the current cycle transition. It is obviously too early to conclude anything about the amplitude of the next solar cycle.